U.S. Supreme Court Justice Ruth Bader Ginsburg sits onstage during a speaking engagement, Saturday, Dec. 15, 2018, in New York. Steven Spielberg, Lady Gaga, Spike Lee and Glenn Close have a message for Supreme Court Justice Ruth Bader Ginsburg: Get well soon. 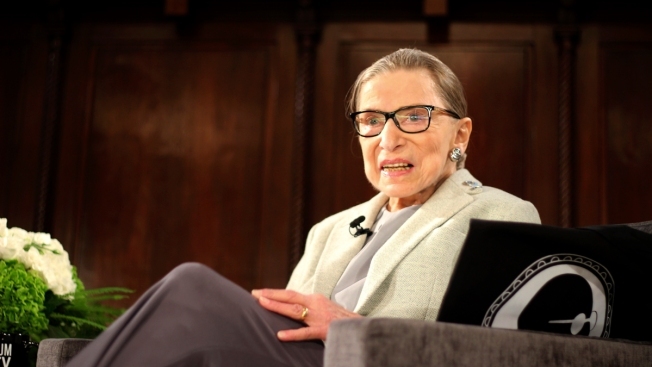 They and three dozen Hollywood A-listers, from Bradley Cooper to Quincy Jones, have signed a card that's being overnighted to Ginsburg on Thursday. The 85-year-old Ginsburg has missed a month of Supreme Court arguments as she recovers from the lung cancer surgery she had in December. In the card, Lee refers to Ginsburg as the "Judge of Brooklyn." Regina King wrote that she is the true, "Super Diva" in reference to a shirt Ginsburg wears in the documentary "RBG." Laura Dern wrote, "You are our grand reminder to use voice + fight for truth." Director Barry Jenkins even stopped to do a plank in honor of Ginsburg's famed workouts after signing. Other signatories include Amy Adams, Ron Howard, Ted Danson, Helen Mirren, Stephen Colbert and Meredith Vieira. The card was spearheaded by "RBG" filmmakers Julie Cohen and Betsy West, who toted it along with them to starry awards season events over the past few weeks including the Directors and Producers Guild Awards, the Oscar nominees luncheon, BAFTA and the Critics' Choice Awards. "After Justice Ginsburg's surgery in December, pretty much every actor or filmmaker we met would ask us to pass on their personal good wishes to her," Cohen and West said in a statement. "We know RBG is a huge movie buff — from big Hollywood epics to small indie films — so we thought she'd get a kick out of a get well card from some of the biggest names in the film world." "RBG" is up for best documentary at the Academy Awards on Feb. 24.